Mt. Prospect, Ill., Feb. 6, 2018 – Time and money are two of the most important commodities around and ensuring optimum use of these resources means key assets are available when needed. For many jobsites that require concrete demolition work, a breaker, demolition or rotary hammer needs to be on hand. The Bosch GSH27-26 Brute™ Turbo is the world’s first breaker hammer with GPS tracking that makes sure jobsite managers know where this powerful tool is at all times; a retrofit option (GPS25-4) brings the same capability to all current Bosch SDS-max™ hammers. The Bosch GPS device on the Brute Turbo and the SDS-max hammer retrofit offer always-on location tracking. The device works for months at a time because it’s powered by a Lithium-ion battery that recharges automatically as soon as the tool is plugged in. In addition, the tracking device can notify a user about various activities, including non-working hour activation and non-authorized location use. Users are notified about these actions via cellular network on a smart phone. The tracking feature, which reverts to cellular network coverage when GPS is not available, can be managed through the free Bosch GPS tracking app (available for Android™ and iOS®). The app can be found online at the Apple App Store® or the Google Play™ Store. During the first twelve months of ownership the tracking service is free; after the initial one-year period the service will cost of $9.99 per month or $99 per year. The Bosch GSH27-62 Brute Turbo Breaker Hammer with GPS Tracking offers an outstanding concrete removal rate, yet weighs only 64 pounds. With 1,000 bpm and 43 Ft.-Lbs. of impact energy, this versatile heavy-duty tool can tackle applications that range from outdoor asphalt work to indoor foundation removal. 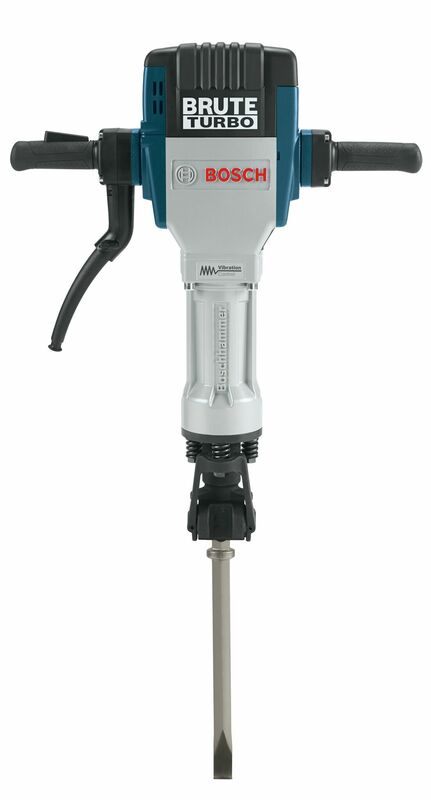 The breaker hammer doesn’t require a compressor because it can be powered by a 115/120V AC/DC 15-amp outlet or a 2,500-watt portable generator. The breaker hammer’s custom cart doubles as a hammer hauler and a hand truck. Truck rails allow the cart to be raised or lowered easily from a truck. The Brute Turbo’s powerful impact energy improves performance, yet doesn’t affect overall durability. Category-leading motor efficiency, minimal energy loss in the seals, heavy-duty springs and fasteners, and a rugged spring dampening system offer users a tool that’s built for power, but doesn’t forget user comfort. The Bosch Service Minder™ Brush System shuts the tool off when brush replacement, lubrication or preventative maintenance is needed and a grease-packed gearbox and hammer mechanism eliminate any potential contamination caused by jobsite lubrication. The GSH27-26 Brute Turbo Breaker Hammer’s Active Vibration Control™ system includes a longer air cushion in the hammer mechanism that reduces vibration levels at the source. Ergonomic shock-mounted handles complete the vibration control system by providing the user with the lowest vibration level possible without adding size or weight to the tool. The Brute Turbo comes complete with a non-slip rubber cover to prevent the tool from tipping while in storage, custom cart and four chisels. The GPS25-4 retrofit is available for ten different Bosch SDS-max hammers that extend from 10-amp power to 15 amps with impact energy from 5.6 EPTA to 17.0 EPTA. No load BPM ranges from 900-2,900 BPM. Operation options include rotary hammer and hammer only modes. To learn more about the Bosch Brute™ Turbo Breaker Hammer with Imbedded GPS Tracking, the Bosch SDS-max™ hammer GPS retrofit or to find a local dealer, visit www.boschtools.com or call 877-BOSCH-99. Check out www.bethepro.com for additional tips and videos.